Part numbers were different between the two passives. This is what Tom's passive looks like. Is this salvageable? We know about simply speakers, but I heard they are not taking orders. If this is the case, are there any other companies you guys can recommend to rebuild this passive? 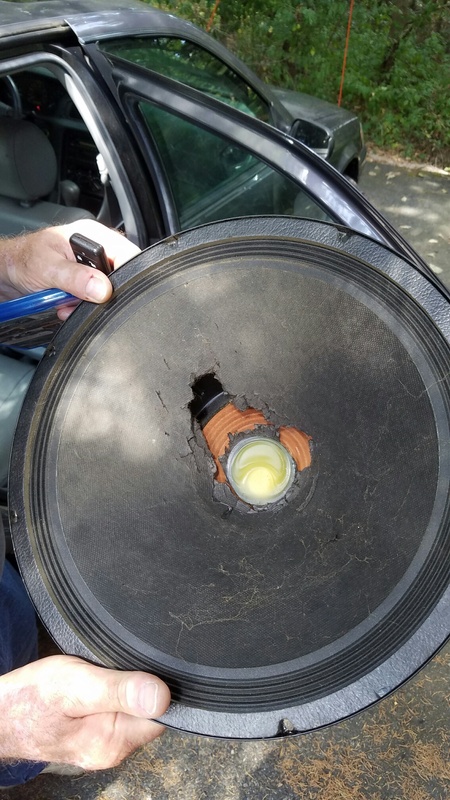 Try Midwest Speaker Repair in Minneapolis. If you have the right measuring equipment and 1 good chorus, you could put in a run of mill passive from PE and add weight until you get the tuning as close as possible. The trouble with having a different Thiele/Small spec on the passive is that is made for that box and that woofer for a specific tune. You can increase the mass of the passive's cone but you cannot decrease it. You also cannot influence how stiff the passive is (CMS). It's a tough problem, but without the T/S spacs on the Chorus' passive, you are flying in the dark without instruments. In a way, that passive looks like a K-33. Could it be possible that they used a K-33 without the magnet as a passive? Do you have any pictures of the back frame and are there any little numbers stamped anywhere?? Yes .....try Midwest.... Simply speakers is not taking anymore orders....for a while.